May 09, 2017 (LBO) – Sri Lanka’s Monetary Board held key interest rates unchanged on Tuesday on slower inflation, a month after hiking rates, a monetary policy statement said. Colombo Consumer Price Index headline inflation decelerated to 6.9 per cent in April from 7.3 per cent in March, year-on-year, a factor which supported the decision, the statement said. The growth of credit extended to the private sector by commercial banks decelerated to 21 percent by end February and 20.4 percent by end March, year-on-year, although growth of broad money (M2b) remained high at 20 percent in March. 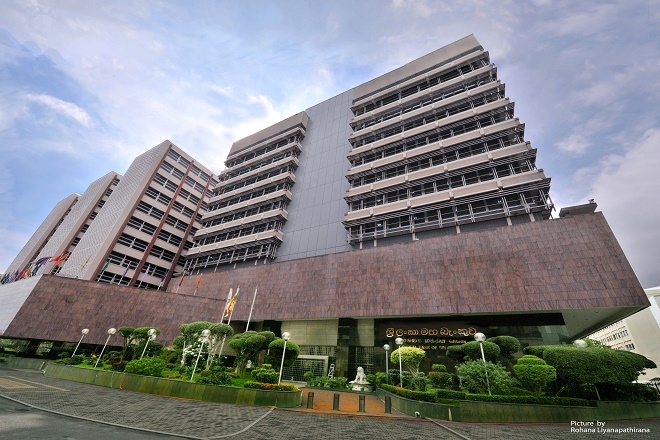 The government securities market and the Colombo Stock Exchange saw foreign inflows in recent months, while the government issued its 11th International Sovereign Bond (ISB) worth US dollars 1.5 billion this month, priced favourably at 6.2 per cent. Given these factors, the Monetary Board decided to maintain the Standing Deposit Facility Rate (SDFR) and the Standing Lending Facility Rate (SLFR) unchanged at 7.25 per cent and 8.75 per cent respectively. effects of tax revisions in 2016. February 2017 and 20.4 per cent by end March 2017, from 21.9 per cent recorded at end 2016.
credit extended to the private sector will decelerate to the envisaged levels by end 2017.
during the year up to 05 May 2017.
adopt further measures, if required.